The Drs: Food Babe Vani Hari Food Labels & What Is Abzodicarbonamide? “Food Babe” Vani Hari came by The Doctors to reveal some hidden ingredients in food. Vani Hari started a website about three years ago to educate Americans about what’s really in our food. She’s ran several campaigns to get bad ingredients out of our food. The Drs TV: What Is Azodicarbonamide? Food Babe Vani Hari warned The Doctors about the hidden ingredients in our food, like the large number of chemicals in cake mix. For example, a year and a half ago she found out that Subway’s 9-grain bread had a chemical called azodicarbonamide, which is also found in yoga mats. Subway and many other bread manufacturers made the announcement to remove this chemical following Vani Hari’s viral video. She also started a petition to get artificial food dyes from Kraft Mac and Cheese and got 350,000 signatures. Kraft has already started the petition. It turns out that many companies sell products in the U.S. with ingredients that are illegal in other countries, but are legal here. These same companies will sell the same product here with the ingredient and there without it. For example, cake mix. 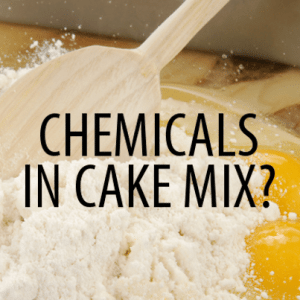 In the United States, there are a bunch of petroleum-based chemicals in cake mix, but in the United Kingdom for instance, those won’t be there. In the United States, we use Red #40. In the United Kingdom, they use Paprika Extract. Red 40 is linked to hyperactivity in children and asthma. Dr. Rachael wondered why our government won’t step up to the plate and get this stuff out of our food, when other nations like China, Japan, and countries in Europe ban these ingredient. Vani Hari said there are thousands of chemicals in our food that haven’t been evaluated in 30 years. Vani Hari said that meanwhile, our heart disease, cancer, and diabetes numbers continue to rise. Vani Hari said that we need to vote with our dollars, because that’s the fastest way to enact change for ourselves and for the nation, because companies will change if their bottom line is effected. The Drs TV: Barbecuing Linked To Dementia? A new study shows that frying or barbecue meats may lead to a higher risk of dementia, memory loss, and other symptoms associated with dementia. Mice have been found to have increased risks of Dementia after being fed these meats. Dr. Rachael Ross said that in the African-American community, well-done food is very popular. She said her mom always sends the steak back to get it more charred. Dr. Travis said that this isn’t a problem for vegetables, but people should be very careful with their meats. The Doctors: Nutrition Label Update? First Lady Michelle Obama wants to make nutrition labels better and easier to understand. Her changes would require companies to print the calories in bigger, bolder fonts. Companies would have to list nutrients that Americans should be consuming, like potassium and Vitamin D. They would also have to list added sugars. Some companies may fight parts of this plan, because the FDA predicts they’ll have to pay $2 billion to fix the nutrition labels. Vani Hari said this doesn’t address the real issue, which is that weird chemicals are in our food. Dr. Jennifer Ashton said they should make it a simple traffic light system, with just the colors red, yellow, green. Dr. Travis said we shouldn’t worry about the labels, but what’s actually in the product. He said if you can pronounce it and know it’s healthy, you’re good. Otherwise, you might be in trouble. Filed Under: The Doctors: Diet Tagged With: Food Babe Vani Hari, Hidden Ingredients In Food, The Doctors Barbecue, The Doctors Charred Meat, The Doctors Charring, The Doctors Food Babe, The Doctors Petroleum in Cake Mix, The Doctors Red #40 Illegal, The Doctors Vani Hari, Vani Hari Barbecue, Vani Hari Cake Batter, Vani Hari Cake Mix, Vani Hari Dementia, What Is Abzodicarbonamide?